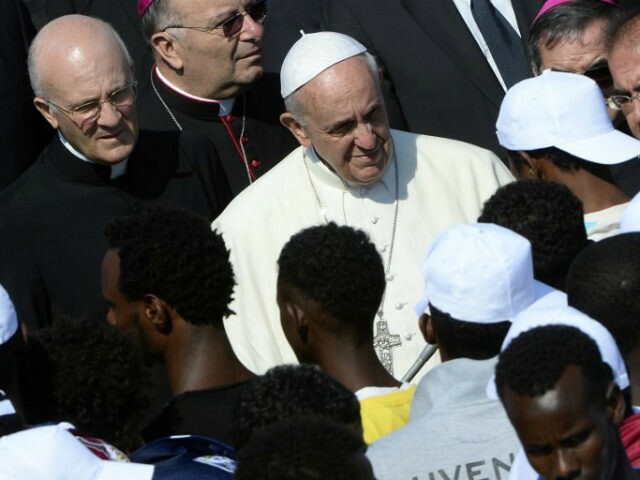 A reality check is in order for Francis: the vast majority of migrants are Muslim who are mostly young males. They are not “sons and daughters” of the Christian God and would be, to say the least, a little bit offended as being categorized as such! Of course, for those who actually pay attention to this cretin, this is nothing new. Since the beginning of his abominable “papacy,” Bergoglio has repeatedly pushed far-out left wing and green causes. What is worse, however, is that Bergoglio is a heretic who has uttered a mind-blowing string of heresies that have disqualified him from being pope of the Catholic Church. Not only has he demonstrated beyond a doubt that he is a heretic, but he cannot be pope on theological grounds. The Argentine Apostate was ordained in the invalid post-Vatican II orders which confer no sacramental grace. He is not a true bishop either since he also was consecrated in the new rite. Bergoglio is simply a layman masquerading as a pope. Nevertheless, “Pope Francis” has been cheerleading for even greater amounts of immigration, excoriating anyone who opposes him suggesting that such thoughts are “sinful.” He has used the Chair which he illegitimately sits in both an immoral and unhistorical fashion. In case Bergoglio is unaware, the popes were the main bulwark against the repeated Muslim attacks upon Christendom in the past. It was the popes that encouraged and inspired the Western princes and powers to take up arms and repel the Mohammedans and reclaim Christian territory, most importantly the Holy Land during the Crusading era. Had it not been for the popes, Europe may have already been overrun by the Infidel or at least had most of its lands compromised. While it is imperative that enemies of the West of the likes of Bergoglio should be rebuked and, if possible, removed from their positions of power, mass migration opponents must likewise address the demographic nightmare that Europe faces. European birth rates have fallen to unsustainable levels and if trends are not reversed, Western man is headed for extinction if not marginalization in global affairs. Declines in native European birth rates stem from factors both economic and cultural: (1) real income have continually fallen in the West which has now required many women to enter the workplace in greater numbers to offset the decline; (2) the Establishment has vigorously pushed the idea of women in professional roles and the nonsensical idea of “working mothers.” Women working during their most fertile years would naturally decrease the number of child births. There are, of course, other cultural factors – divorce, contraception, abortion – that have effects on low birth rates, all of which need to be taken in account before there can be a return to a more populous European Continent. Foreign policy has contributed to the migration crisis. The US policy of regime change in Iraq, Libya, and its attempts to do so in Syria and now Iran has dislodged millions, making it easier for the powers that be to orchestrate their coercive mass migration schemes. There can be no compromise on mass immigration, the future of the European peoples and their glorious past accomplishments hang in the balance. While the enemies of Western Civilization such as “Pope Francis” want to eradicate this legacy, there is still significant numbers that understand the importance of preserving its past and the promise of its future. For those who seek Western man’s survival, the heroic attitude of the Roman statesman, Cato the Elder, should be adopted who, after every speech, called for Rome’s lethal enemy’s destruction, “Carthago delenda est.” Hopefully, the proponents of mass migration will share the same fate as the Carthaginians did. This entry was posted in Bergoglio, Culture, Europe, European History, foreign policy, History, ideology, Immigration, Left, Liberalism, Merkel, migration crisis, Mohammedanism, New World Order, NWO, Political Correctness, Pope Francis, Uncategorized, Western World and tagged Bergoglio, Christendom, Culture, Decentralization, Europe, Germany, History, Immigration, Muslims on January 8, 2018 by antoniusaquinas. Jorge Bergoglio is the “purported pope” of the Catholic Church because, as certain theologians have argued, he was neither validly ordained as a priest or consecrated as a bishop in the traditional Catholic rites of Holy Orders. Since a pope must first be a bishop, in particular the bishop of Rome, Bergoglio cannot, therefore, be pope. He is not a Catholic pope, but head of a new “Conciliar Church” which was concocted at the time of the Second Vatican Council (1962-65), actually an “Anti-council,” and in the tumultuous years that followed, which witnessed fundamental changes in doctrine and the Sacraments, most damaging the promulgation of the New Mass by Paul VI-Montini. The New Church also did away with its traditional view on evangelization and conversions and adopted the previously condemned heresy of “syncretism,” which contends that “we all worship the same god,” and that “one religion is as good as another.” This idea pervades post-Vatican II Catholicism and is what Francis bases most of his justification for the mass migration onto lands which once made up Christendom. While Bergoglio cannot be pope on technical grounds, he is also disqualified for his blasphemies and heretical actions, words, and teachings, all of which have flowed at a breathtaking pace. From the infamous, “who am I to judge,” about sodomites, to his alteration of two millennium of teaching on divorce and remarriage, to such whoppers as “God does not exist,” Bergoglio has placed himself “outside of the Church” and thus cannot hold ecclesiastical office and certainly not that of supreme pontiff. Despite the overwhelming theological and empirical evidence that the Chair of St. Peter is vacant (sede vacante) and its restoration will take place in its Founder’s good time, for the vast majority of Catholics and the world at large, Jorge Bergoglio is pope and his actions have consequences. And, since his promotion and support of mass Muslim migration is leading to not only the destruction of what is left of Western Civilization and the species which largely created that civilization – white, gentile, heterosexual men – Bergoglio and the organization which he represents, must be stopped. If Pope Francis and his New World Order cohorts are not countered, whites, and the cultures which they built, will vanish. The Catholic Church is an integral part of Western Civilization even if Bergoglio and the pack of cultural Marxists prelates which surround him will not admit it. It was the Church that preserved the heritage of Antiquity from the barbarian invasions during and after the fall of the Roman Empire. Without the actions of the monks and other clerics, many of the classical works would have been lost forever, leaving future generations bereft of the wisdom and treasures of the Ancients. It was the Church that was the indispensable part in the formulation of the greatest civilization known to mankind, Christendom. Moreover, it was the Catholic Church, largely through the Papacy, that inspired the Crusades, which for a glorious time drove out the Muslims from the Holy Land and returned it to its rightful possessors. It is undeniable that the Catholic Faith (which Bergoglio is supposedly its chief representative) inspired numerous European sovereigns, most notably Queen Isabella, to take up arms against the Mohammedans. It was her faith which drove the heroic queen to free the Iberian Peninsula from the Muslim yoke, which then allowed her to finance Christopher Columbus on his epic, world-changing voyage. Yet, Bergoglio and his fellow heretical Churchmen assiduously avoid any reminiscing of such facts and instead are deliberately encouraging Muslim migration into the lands that Europeans spilled blood and sacrificed treasures to defend – Queen Isabella must be turning over in her grave! If Western Civilization is to be salvaged, those who seek its destruction must be removed from their positions of authority and influence. Whether through political means, armed revolt, or de-legitimization, those who hold such power must be toppled. Exposing “Pope Francis” for what he is, or is not, will go a long way in that most vital and necessary task. This entry was posted in Bergoglio, Catholicism, Crusades, Europe, European History, History, Mohammedanism, Muslims, Political, Pope Francis, Queen Isabella, Uncategorized, Western World and tagged Catholicism, Europe, History, Immigration, Political on October 5, 2016 by antoniusaquinas. Despite being rebuked and humiliated by the Republican presidential front runner over his inflammatory statements about U.S. illegal immigration policies, Newpope Francis of the Vatican II sect has continued to opine about the migration crisis. Europe “complimented and improved”?! Right. Tell that to the thousands of women who have been raped, assaulted, and terrorized by mostly Muslim fanatics, or look at the widespread destruction of private property that these trespassers have wrought, and worse, the cultural transformation that this deliberately created crisis has produced. At one time, Europe fulfilled its “universal role” by engaging in a series of military actions (the Holy Crusades) which were mostly inspired by true popes (which Bergoglio and his Vatican II predecessors are certainly not) to expunge the infidel from the sacred places where the Founder of Christianity lived, preached, was crucified, and gloriously rose from the dead. These authentic successors of St. Peter, in particular Urban II and Innocent III, understood the threat that Mohammedanism posed to their flocks both spiritually and culturally. 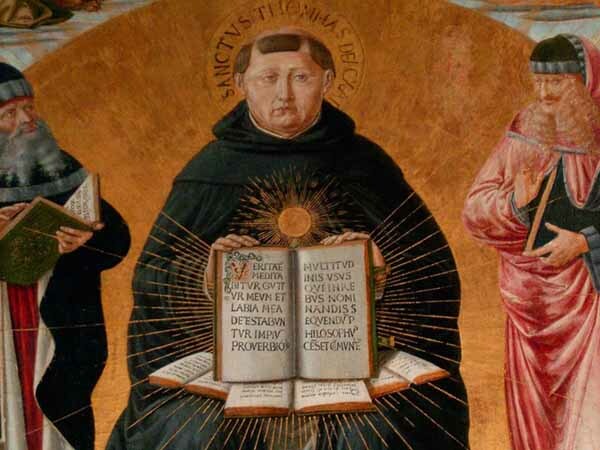 The failure of Christendom to ultimately defeat Islam and drive it out of the former lands of the Roman Empire was not the fault of the popes, but that of the secular powers who increasingly sought their own aggrandizement. If the European principalities had heeded the popes’ calls and driven the Muslims back to their tribal homeland, history would have had a happier outcome. Bergoglio, if he cared to look, would find that Europe’s “universal role” included the justification of “holy war,” in the use of violence against Islam, not only during the Crusades, but in the re-conquest of Spain, and in the defense of its homeland from numerous Muslim assaults. Moreover, the idea of Muslims living side-by-side with Europeans or being able to create their own autonomous communities would have rightly been considered societal genocide. No authentic pope would be engaged in “dialogue,” common prayer meetings, or other ecumenical interchanges with Muslims as Bergoglio and his Vatican II predecessors have repeatedly and blasphemously done over the years. Any pre-Vatican II pope, theologian, bishop, priest, or, for that matter, astute layman would properly consider such actions abominable and would recommend as punishment a rendezvous with some of the scum that abounds at the bottom of the Tiber for its transgressors! Bergoglio and most of the Newchurch hierarchy’s support for free migration and open borders and their condemnation of those who have opposed such lunacy clearly demonstrates that the Vatican II sect is part and parcel of the New World Order which seeks the eradication of sovereignty and the extinction or at least subjugation of European peoples to the global elites. Not only is this cretin wantonly overturning two thousand years of traditional Christian teaching on morality, but he is openly encouraging the destruction of those societies which that morality ultimately helped to build. Despite the skillfully and deceitfully crafted persona as “Mr. Humble” and his white pontifical attire, “Pope” Francis and the sect that he heads are a clear and present danger to what remains of Western civilization and must be opposed and removed from power. This entry was posted in Bergoglio, Catholicism, Crusades, Culture, Europe, European History, History, Immigration, Mohammedanism, Muslims, Political, Pope Francis, Uncategorized and tagged Bergoglio, Catholicism, Culture, European History, History, Immigration, Mohammedanism, Muslims, Political, Pope Francis on April 10, 2016 by antoniusaquinas.